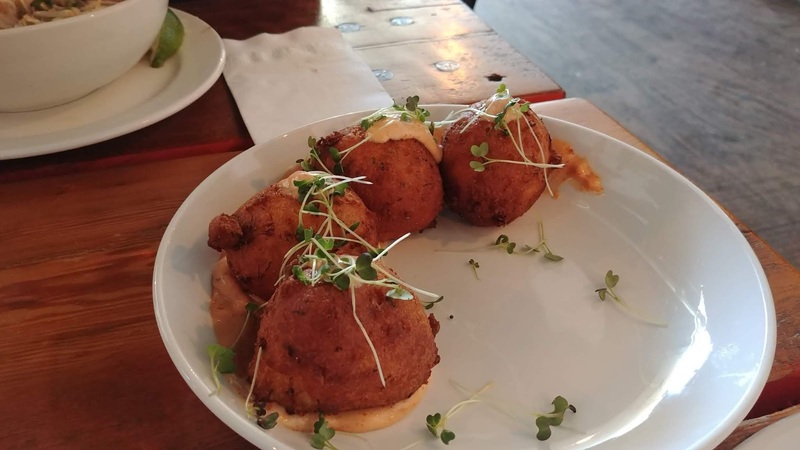 A couple weekends ago, we made our second trip to Smallman Galley. There are 4 restaurants, 2 are the same as the last time we went, and 2 are new. I ordered from Home. 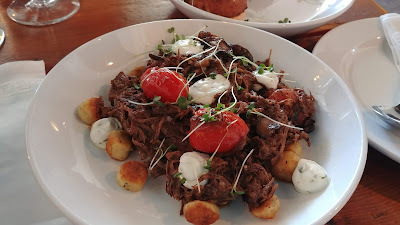 I chose Meat & Potatoes (short rib ragu/ parmesan gnocchi/whipped basil). It was delicious! I had some leftover because there was a lot of short rib, but I ate all the tiny gnocchi. Yum! They were huge! And yummy. I managed just half a hush puppy while SP ate one and half. We took the other two home. SP ordered his main meal from Banhmilicious. 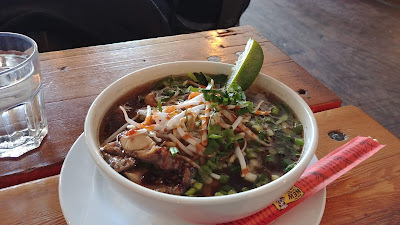 He got Noodle Soup (PHÕ) - grassfed bone broth, choice protein, sprouts, onions, cilantro, sriracha, hoisin, lime, jalapeño. I liked the broth, it was very warming with what I think was cinnamon and maybe anise? He loved his noodle bowl. Our food was delicious and the people who work there are terrific. We also each had a glass of wine from the bar. SP chose a rose, I had a Beaujolais Blanc. I was surprised that around 5 pm there was hardly a free space to sit down and eat. We ended up at a communal table next to a large group of 20-something girls which didn't really make for a great date night atmosphere, but that's OK. I like that there are different food options so SP can have something he really enjoys but that I do not enjoy and I can still have something I really like.